Doing the Disney College Program with No Car! Soooooo, I keep getting emails and comments years after my program on this topic, sohere is my long over due new post on getting around without a car during your Disney College Program. I've managed to do 3 Disney College Programs with no vehicle, and I still manage to get around to grocery shopping, malls, and Orlando events. A new thing a lot of CP's are doing is purchasing an annual passes to Universal (at the Florida resident rate - talk about it later). This gives unlimited entrance to Universal and you have access to Disney Parks. I purchased an annual pass for my program extension, and it was the best investment ever!!!!! I have no regrets spending the $180. It was well worth it. I went to Universal over 10 times with NO CAR. I went to a very popular Korean BBQ place with no car, it took some time but was no problem. Got to Downtown Orlando, no problem. There is also a way to get to Busch Gardens in Tampa!! Beaches? Yep! Miami? Sure! Disneyland in Cali? Yeah! Itrolley - This is your best friend!!! If you wanna get away from Disney. Take the trolley that goes up and down International Drive, also know as, Idrive. 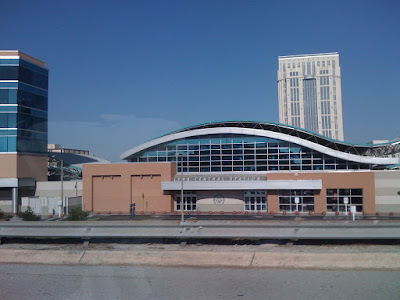 Idrive is a long strip of resorts, restaurants and tourist attractions. Matter of fact, Chatham and Patterson are right off Idrive. The location of Disney housing is perfect. It was a great way to doing new things and getting away from Disney for awhile. SUPER HOT TIP - Flash your Disney ID to take the trolley for .25 cents. It normally cost $2.00 per ride!! It's amazes me how many CPs don't know about this tip. It's not advertised on the website, and drivers don't say anything. I used this frequently!!! Where's the Itrolley? From Commons apts, you need to walk across the street to the parking garage - walk through the garage and to the Outlet. Keep walking through the outlet, you need to come out near the Anne Taylor Loft and American Eagle store (see this map of the store outlet). Walk to the corner and you will see a bus shelter. Take the bus on this side (the side Outlet Mall is on) to get to International Drive. When you return from Idrive, get off at the McDonald's. Your bus stop pick and drop off is called Orlando Premium Outlets VINELAND AVE. There are two outlets, you do not want the International Drive location. There is also 2 lines and Red and Green. The red line is the one you want majority of the time. Visit the site for more information. 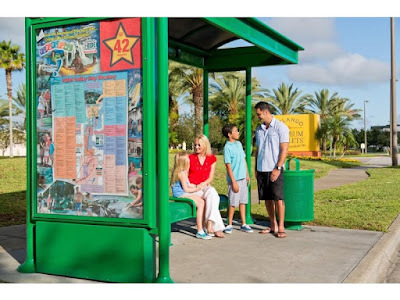 HOT TIP: At the bus shelter, there will be a board that looks similar to the picture above with the route and there will be a list of restaurants, shops, and attractions with a letter and/or number next to it to indicate where to get off. 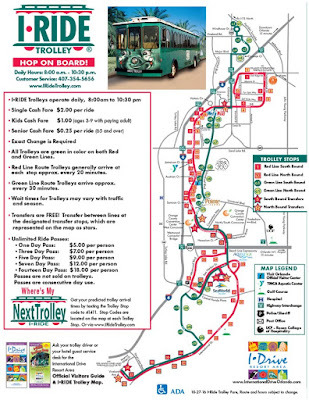 Each stop is announced on the trolley, so it's easy to find your stop. 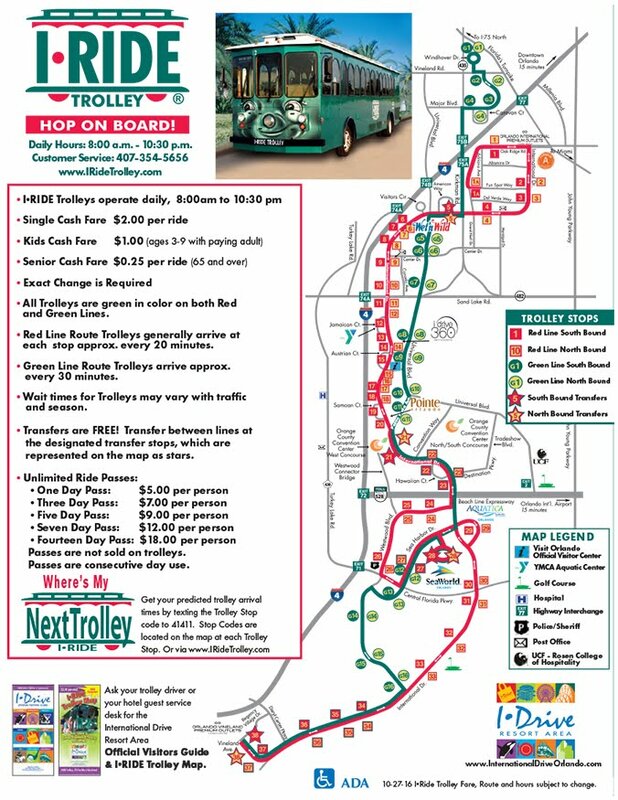 The Premum Outlet Mall Itrolley Bus stop: You can catch the LYNX Bus 8 which takes basically the same route as the iTrolley but goes much faster and cost more. You can get off this bus and transfer to other LYNX buses if necessary. 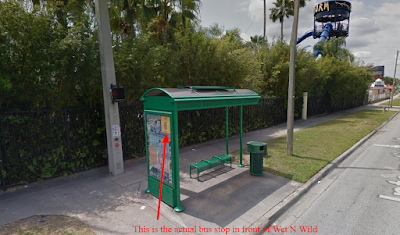 Disney Springs LYNX Bus Stop: This is another stop you might not have considered or heard of when getting around. The CP Bus ( Bus F) to Disney Springs, get off and walk to the entrance at the very front near Earl of Sandwich. Come out and you will see a crosswalk. Cross the street, and right on the corner is a bus shelter (can't miss it). Also note, this info is based on the old F Bus stop (at casting) before it was Disney Springs. The new F Bus stop is over by Team Disney/ Casting (I think), so you could probably walk down the street to the bus shelter since it's on the same side of the road. This bus will take you through Hotel Plaza Blvd, then it will turn on Apopka Vineland and go to the corner near Olive Garden. It will turn again down Palm Parkway near Pizza Hut and continue on. You can get to Chevy's Sweet Tomatoes, Burger King, Ale House, Goodings Grocery store (kind of expensive), Taco Bell, Buffalo Wild Wings, IHop, Hooters, Kobe Steakhouse, Sea Dog Brewing Company, and the Video 1 Game Bar (cool place). Plus many, many more restaurants, and shops. The bus number is 300. Bus 300 is an express bus that goes straight to downtown Orlando and will take you directly to the LYNX Central Station. This bus takes the Highway instead of taking the back roads to get you right in the heart of Downtown to the Central Station. Once at the Central Station, you will have access to numerous bus routes. This will require more research to your destination, but can be easily done. Bus 50 (the Magic Kingdom bus) will also stop at Disney Springs, go through Palm Parkway, but will break off towards the International Drive area. I don't recommend taking this from MK, unless you're already there. Getting off Disney Property takes forever. Just use the CP bus to get off Disney Property. For the locations that are hard to reach by public transport, a shuttle bus will be your next option. The most popular company is Mears. They are used by Disney for the Magical Express, and you might have used them to get to Vista for check-in. So this is a huge company. Super Shuttle is also very popular and use throughout the US. They will be your go to when you need a ride to the airport. It's $20 one way. Look for coupons and codes online. 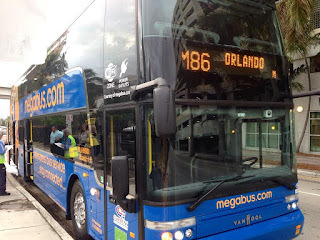 MegaBus - An extra cheap way of getting to certain Florida destinations. They have routes as cheap as $1. No Kidding!! With on board wifi, and comfortable seats. Greyhound - I've been to the Orlando station and it's a bit far from Disney Housing. You will need a cab to get there unless you get a roommate to take you. Only take this if it's necessary. Use MegaBus instead. Flights - If your looking to travel out of state a bit (I'll get into this later) than look into Spirit Airlines and Southwest Airlines. Spirit Airlines is consider the taxi of the airways because it's very cheap and low budget, but gets you to your destination. Taxis - I mostly use this if I'm staying at a location that operates beyond public transportation hours, too tired to take the bus back, or need to get somewhere ASAP. Uber/Lyft - An wonderful alternative to taxi cabs. This may be a lot cheaper than taxis. There are many codes and special offers to get free or discounted rides. Okay, I covered the different methods of transportation available to CPs and a little about how to use them. Don't be scared to try them out. No one really bothers you, go with a friend if you need to, be alert and play it safe. Keep some dollar bills and coins on you because you will need exact fair. Many cabs have credit card machines. Shuttles and coach buses require research and advanced bookings. Okay to get to Seaworld and Aquatica (the water park) - Simply take the Itrolley and get off the bus at the designated stop. You honestly can't miss it!! Oh, Seaworld and Aquatica are 2 different stops on the Red Line. Aquatica is first then Seaworld. Now Universal will take some walking - about 7-10 minutes. It's not bad, a little tiring after a full day of coasters but it can be done. You will need to take the Itrolley from the Outlet mall near housing. You will need the Red Line to get there. Your stop is about 20-30 minutes away (quit whining it only cost 25 cents). If taking the Red Line you will get off at Stop 6 - Wet N Wild. This will drop you off in front of the Wet N Wild water park entrance. Once you get off, walk to the corner and cross the small street first. Then cross the busy street which is International Drive. This puts you on the correct side of the road. As you walk, you will cross a bridge then there will be a crosswalk near a pond with cars coming off the highway. Be careful here! You will then pass a parking garage, keep walking straight until you see a staircase to your right. Walk up the steps and you will be coming upon the entrance. If you mistakenly get on the Green Line the stop is G5. HOT TIP: You can view this entire walk through Google Maps street view. Take the 300 bus from Disney Springs or catch the Lynx Bus 8 at the Premium Outlet Mall. Use the 300 as an express bus to the central station which is in the heart of Downtown. The number 8 (similar route as the trolley) goes through International Drive but eventually ends up at the station. Bus 300 is a better option, but this will require you to take the CP - F Bus to Disney Springs first. Remember the Mears Shuttle I mentioned earlier, well they run a FREE bus to Busch Gardens. You must have a Busch Gardens ticket to ride for free. If you don't have a Busch Gardens ticket, it will be $10. SUPER HOT TIP - It now picks up at Chatham and Vista. You could also get picked up at the Publix across from the Outlet Mall. Shuttle is FREE with any paid Busch Gardens ticket. 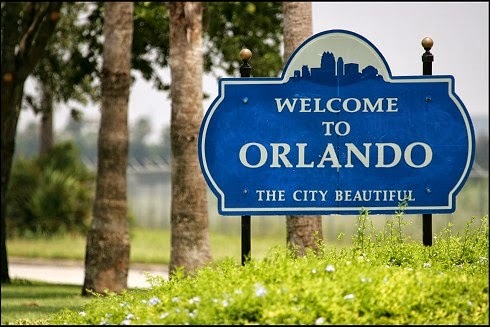 Passengers are responsible for transportation to and from the designated pickup and dropoff locations in and around the Orlando area. Mears Taxi services are available at a minimal charge by calling (407) 422-2222. Arrival time at Busch Gardens is subject to change: could be as late as 11:30 a.m.
Departure time from Busch Gardens depends on park closing time. Please call the number below for exact departure time. # of stops for each shuttle are not determined until day of trip. Your shuttle could potentially have a maximum of 3 stops on the route. For additional information please call 1-800-221-1339. Call first for the most up to date info, and then proceed with booking. 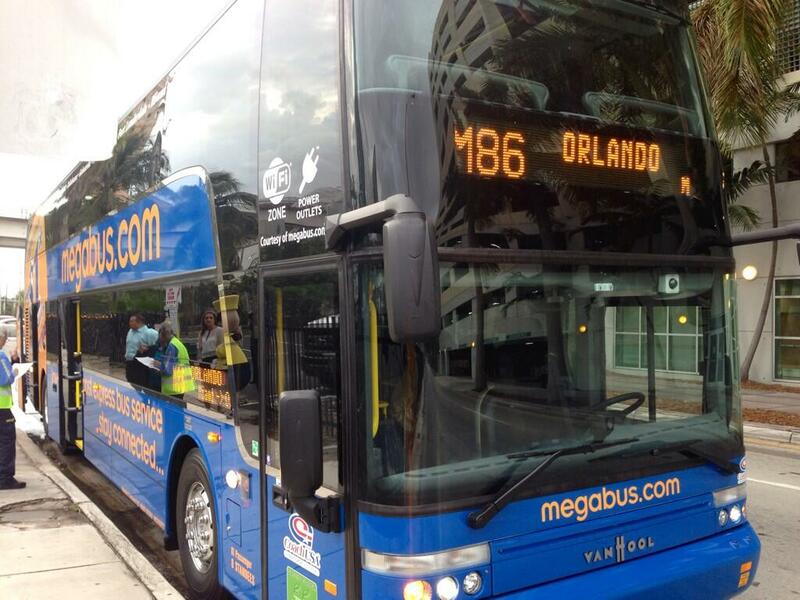 Okay, I mention the Bus 300 Express Route earlier, well you will need that bus in order to get the MegaBus. The MegaBus location is down the street from the Central Station. If you inform the driver, they will let you off at the MegaBus stop. Once a the MegaBus stop, you will line up, wait for the bus to arrive. Once it arrives, the driver will check you ticket. You sit where you want, get comfortable and then enjoy the ride to Miami. Note: This bus doesn't stop in South Beach. It stops Downtown and at the Airport. However, it cost about $15 via cab to get the South Beach. Some hotels and hostels offer a free shuttle from the airport. There's also a cheap bus at the airport that will take you straight to South Beach for a dollar or two. Disney Housing Events - Okay, when you get those housing newsletters make sure you read them because you could be missing out on some great day trips to other Florida cities and beaches. Sometimes they are free!!!! I've done quite a few trips and they have been awesome. Disneyland - CA - Your ID can get you into Disneyland as well, and yes I've done this on a CP trip. Unless things have changed your ID is your ticket. I booked a trip to Los Angeles during my first CP, we used Spirit Airlines and it was super cheap under $200 or so round trip to get to there. Could more or less for the flight. I also took that time to visit Universal Hollywood. Good times. Using a Taxi Cab - Okay for those Fall CPs out there that go to Halloween Horror Nights. You can take the trolley to Universal. Getting back might be a problem since the routes stop running early on weekends specifically. Just take a cab and split the cost with friends. For me and my friend to Chatham was $25. It was worth it since it was so late. Use Uber/Lyft - to hit up Orlando festivals and concert. Orlando has some awesome festival that are worth visiting. This is amazingly comprehensive. You put a lot of work into this. Do you mind if I cross post this at the DCP Parents' Facebook page?